After the busyness of weeks leading up to VBS and the intensity of VBS itself, we always take the following week off as a team. Since our car was in need of an inspection, we were stuck at home most of the week. 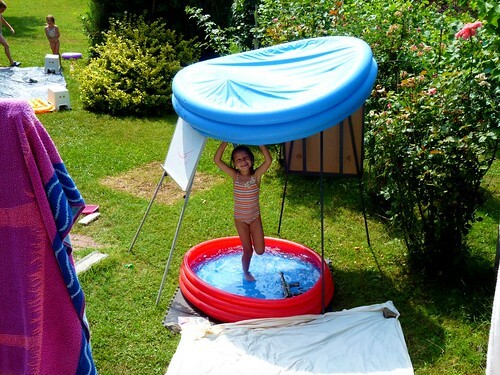 Above: Ellie having fun in something dad threw together from stuff in the basement for splashing in the shade. Last week, temperatures were consistently in the upper nineties and this was about the only way to keep the kids cool throughout the day. 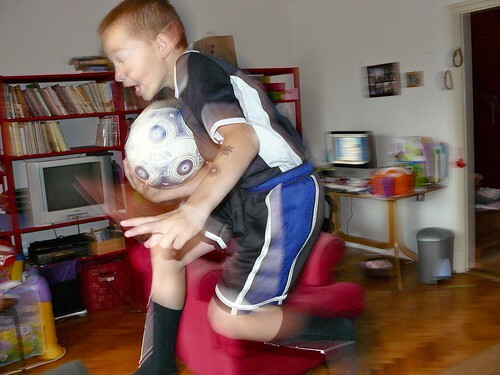 Above: Even though the World Cup is over, Ben often convinces the girls to play as their favorite teams in the Cup. Above: A bit of relief, as a summer storm rolls through PetÅ‘fiábánya and cools down temperatures. 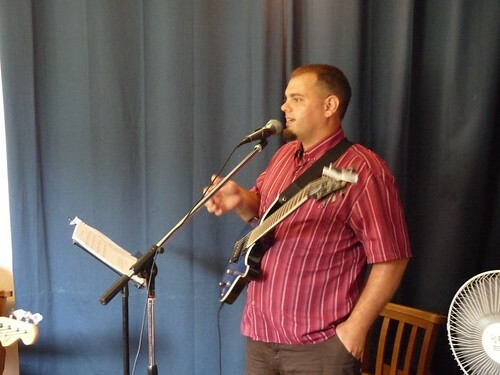 Above: Miki leading our worship service on Sunday. Above: Hugi wishing Anna happy birthday after service. I praise God when surveying the faces in our church. God has drawn people from all different ages and produced unity through His Spirit in us. One visitor, Csaba, who has attended over the past month commented on how our members love one another and how that deeply struck him and drew him back week after week. 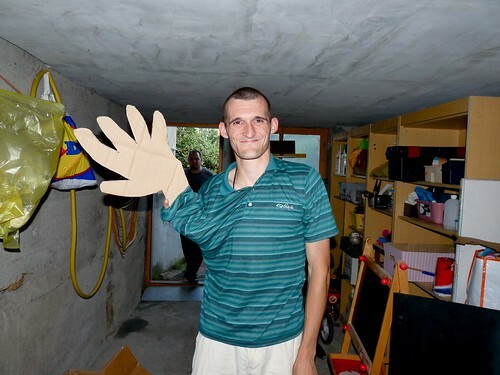 The unity that God is creating in our church is an answer to His prayer, a result of His work and it is very evident to those (like Csaba) who visit our church for the first time. 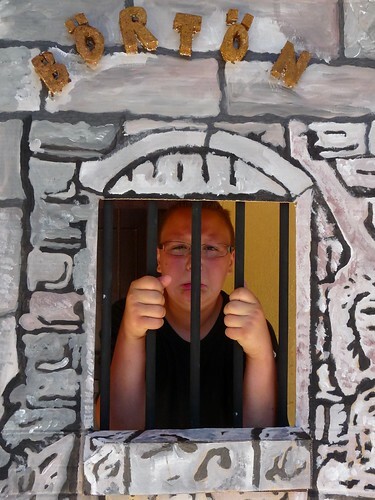 Csaba continues to struggle in his life and is definitely seeking answers and help. Please pray for God to deliver him from the destructive life of sin and to cause Csaba to be born again to a new life and new hope in Christ. 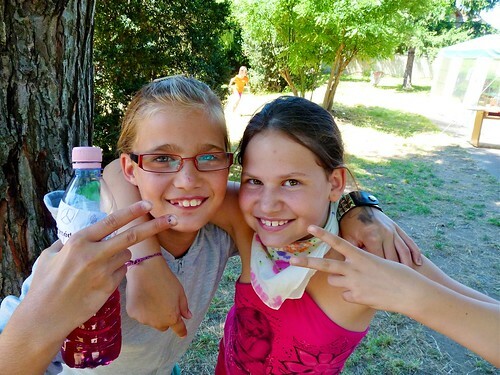 Above: Alina (L) and our Kira (R). As part of worship service, we broke up into pairs and were encouraged to pray for one another. 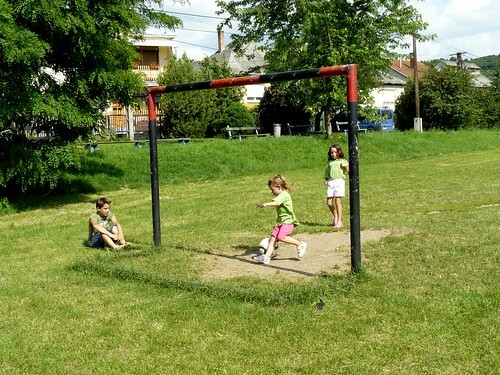 Miki also encouraged the kids to do the same. After finishing up my time praying for another member, and heading back to the front, I saw Kira and Alina with heads bowed holding one another shoulders and praying for one another. Afterwards, Kira ran up to me and said, “Dad, dad, Alina prayed for God to heal my heat rash and I prayed for her boo boo on her nose.” What a joy to see these little ones in communion with God and practicing Christian fellowship with one another. Last week I shared a prayer request for getting our car inspected and papers in order without all the red tape. Praise God the whole process was smooth! On Friday I received the papers necessary to proceed to get the car inspected. I was able to wait in line at a local shop and within a few hours the work was done. The office I then needed to go to was already closed (Friday), so I waited until today (Monday) and brought in my papers. I found out that I needed to schedule an appointment, but the worker was helpful and asked for me to return later int he afternoon. I was given various instructions on what needed to be done before returning and once I came back, I had new papers, new license plates... all in one day... amazing in Hungary. Thank you for your prayers, God graciously answered. 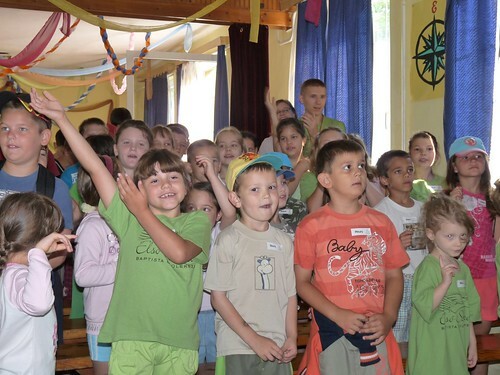 Above: Hugi, Marika, Kira, Ellie, Anna, Lidi and Betti joining arms as we prepare to sing a favorite worship song from our VBS camp that is based on Isaiah 43:1: “Fear not, for I have redeemed you; I have called you by name, you are mine.” Marika (above pink shirt) was not originally ‘signed up’ to help in our VBS because of responsibilities of caring for her daughter and husband at home. 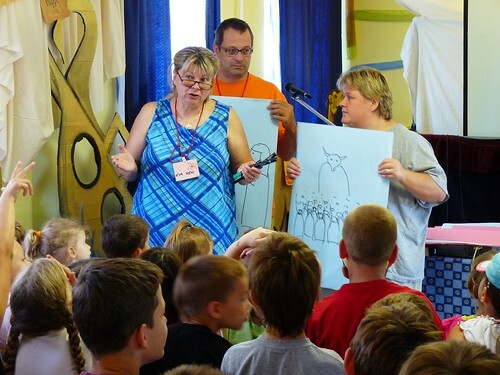 Marika, full of joy, gave testimony of how God called her out to serve in our VBS the past week and provided the necessary strength and help that both her daughter (who suffers from schizophrenia) and elderly husband needed. 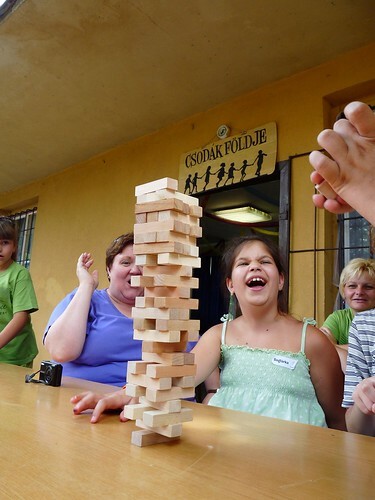 Marika had seen the pictures of our camp in previous years but commented that it is completely different being there and seeing the amazing work that God is doing. We were very thankful for her sacrificial help in the kitchen the entire week which freed up others to spend more time with the kids. Above: Brenda, Eszti and teenager Eszti who was part of the teen group in our VBS. This is the first time that Eszti has attended our worship service, however she practically knows all of our church members through various outreaches she has been attending throughout the year. 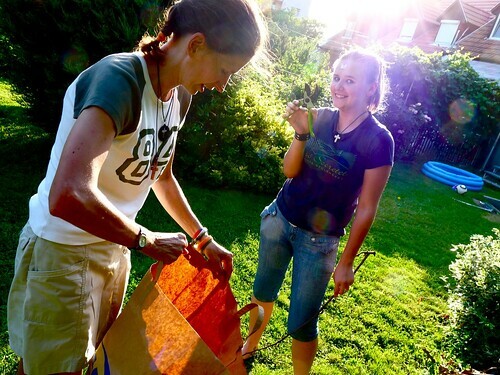 Teenager Eszti has formed a bond to Eszti (long time member of our church and mother of 4). who has been able to share various truths about salvation and a living relationship with Jesus Christ over the past few months with her. Because of responsibilities at home teenager Eszti may not be able to attend church on a regular basis, but she is definitely seeking ways to be in fellowship and learn more about Jesus. Praise God for his work in her life. I continue to meet with three teens, Ricsi, Erik and Roland who made professions of faith in Jesus Christ this past month to teach them about foundations of our faith and baptism. We have gone through basic truths about prayer, and how to read God’s word in order to be led by Him, to worship Him through it and to be spiritually nourished by it. Some of them have begun to journal their times in the Word and it is exciting to see God’s Spirit giving them understanding about this new hope they have entered into through Jesus Christ. This past Sunday we began studying justification by faith in Christ and our lack of ability to earn God’s acceptance through our own merits, ‘good’ works and our own strength. If you missed following our blog over the past few weeks, here are some films that I made for parents who had kids in our VBS. 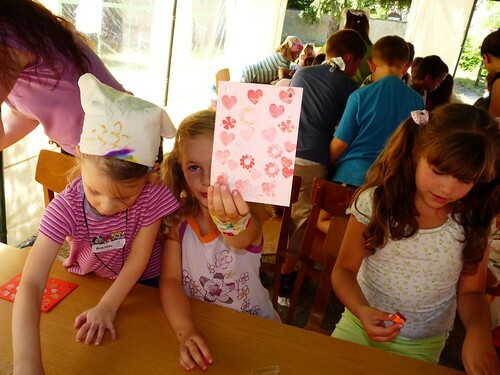 • Just before VBS we had our very important car papers taken away by police on a random stop. The short story is that the car’s inspection was overdue (oops) and the police are legally bound to confiscate the papers . We are now waiting to receive a temporary permit to take the vehicle to be inspected and then fill out a bunch of other paper work to be able to drive the vehicle again. Please pray that all the red tape would become no tape and that we could finish this process successfully. • English camp is just around the corner (15 days away!). 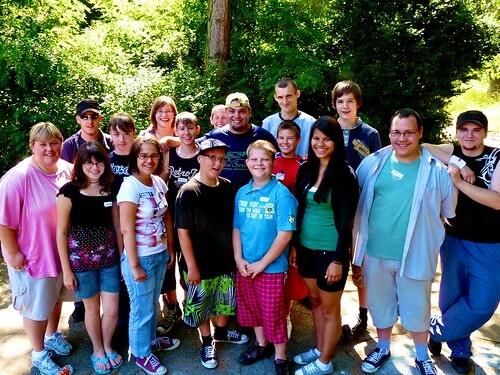 This is an exciting summer ministry that takes a lot of preliminary work to make happen. Please pray for wisdom for all aspects of planning and for God even now to be preparing the teens and young adults’ hearts to hear and understand His gospel of hope. Thanks for standing with us in prayer and for supporting us through your encouragement! Above: Erika did a great job involving the kids in Friday morning’s teaching on Jesus feeding the 5000. Above: Teenager Niki helping her small group learn Friday’s memory verse. 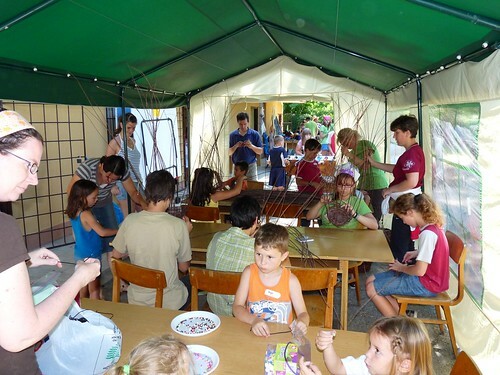 Above: Our “free time” each day is actually full of activities that the kids can choose from like hand crafts, basket weaving, zip line and soccer. 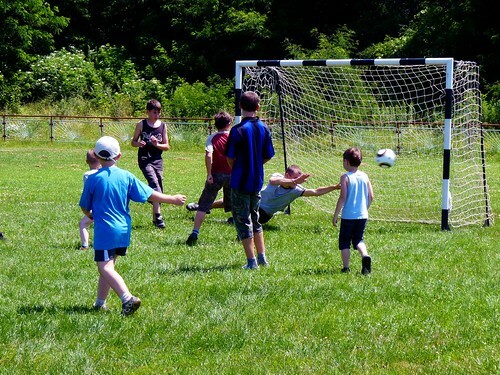 Everyday Gabi and I took a group of campers out to PetÅ‘fibánya’s soccer field which is a few minutes walking distance from our camp site. 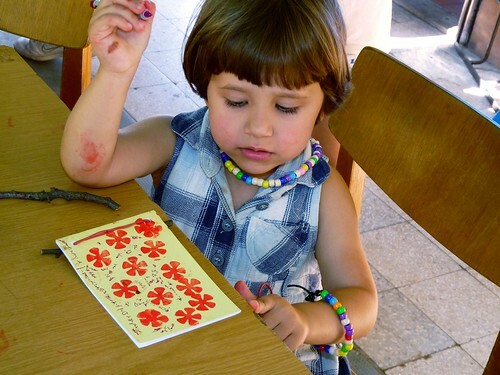 Above: Klári’s daughter Réka showing her freshly stamped cover for the prayer journal craft. 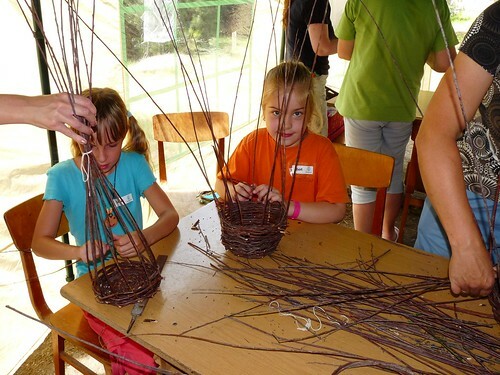 Initially, Réka came only to help her mother with the basket weaving free time, but over the last few days has been attending classes and connecting with other kids and teachers. We are thankful for our friendship with Klári (who has attended our English Bible study for the past year) and look forward to spending more time with them over the summer. 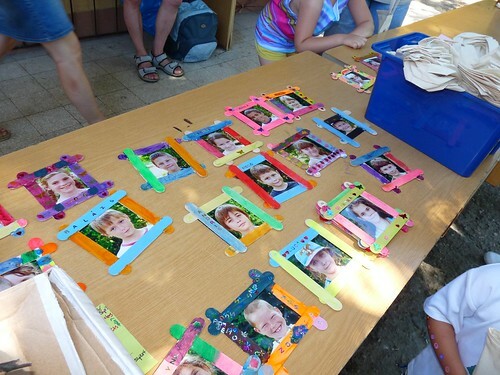 Above: Zsofi’s picture frame. She chose to put the words “Bible Camp” at the top. 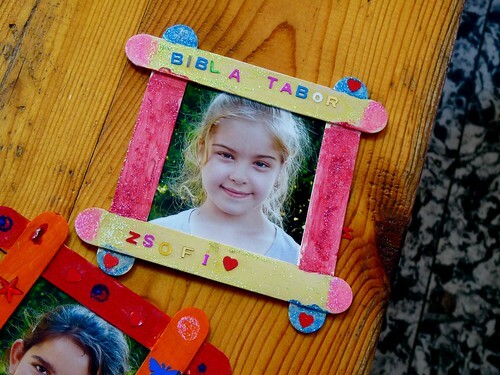 Zsofi is one of many of the kids in our VBS who attend a Bible class with Miki in PetÅ‘fibánya’s public school. The freedom to hold these classes however may no longer be allowed next year as recent changes in the law may prohibit Miki from teaching. Above: Some of the parents who attended today. Above: Éva giving our final morning teaching on the life of Joseph. Drawing various stages of the story, Éva illustrated the injustices that Joseph suffered and his continued trust in God even in the dark times. Our theme verse for the day was Rom 8:28: “We know that God causes all things to work together for good to those who love God, to those who are called according to His purpose. Above: We had around 15 parents show up for our open invite for our last day of camp. 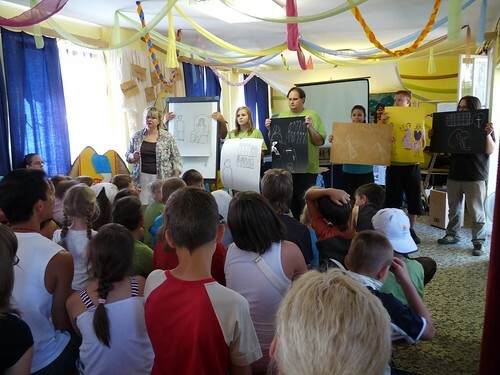 While the kids went to their small groups, DezsÅ‘ held a study for the adults covering some of the topics we have been teaching the kids throughout the week. I was able to speak with one of the parents over lunch who’s daughter is attending our VBS for the first time. 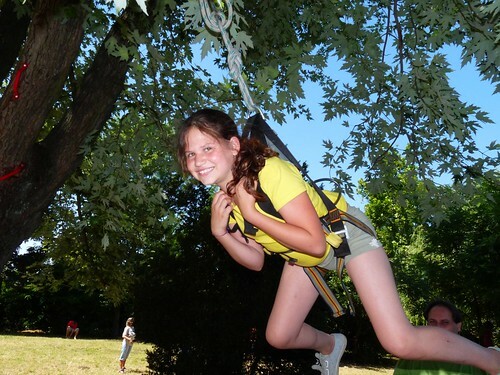 She said that although her daughter Niki was nervous the first day, she is now having a great time and looks forward to next year’s camp as well. Above: Last day to finish your baskets! Above: Benedek opened up and began talking with Miki in free time about questions he has about God. Above: Erika and Brenda’s small group. Above: Gabi and Roger’s small group. Gabi shared with me how great camp was this year and how he just wished he would have been here last year as well. At that time Gabi had turned his back on God and hardened his heart. 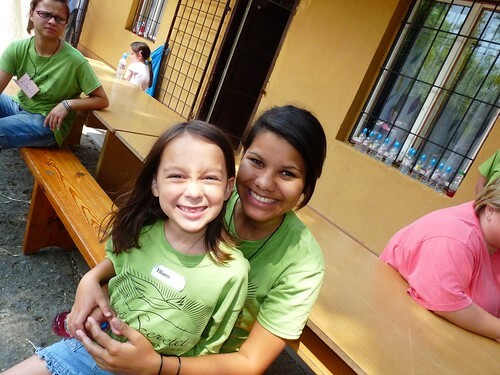 God was faithful to turn Gabi back, graciously forgive him and provide a way for Gabi to attend Bible school. What a joy to see him serving with us this year! Above: Kriszti and Niki’s small group. Above: Éva and EnikÅ‘’s small group. Above: Laszló, Hugi and Anett’s small group. 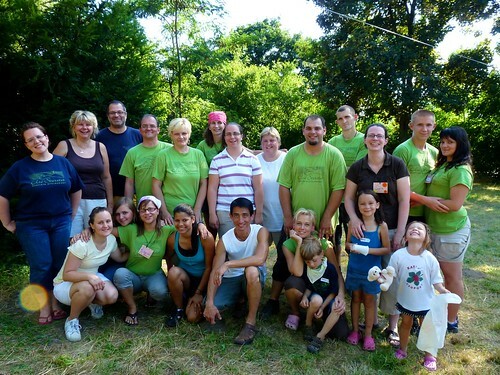 Above: Kitchen staff, craft facilitation and camp helpers. Above: Exhausted but still smiling. Above: Goodbye hugs. “Behold, how good and pleasant it is when brothers dwell in unity!” — Psalm 133. I am very thankful for those who served together to make this camp a success and God’s gracious gift of unity that we maintained throughout the rigorous schedule that left us truly fatigued each day. There was clear evidence of God’s Spirit at work in us to not become grumpy, complaining or selfish. He gave us strength and ability to be His witnesses to these he had entrusted into our hands for this camp. We thank all of you particularly who have been praying for us over the last six days. 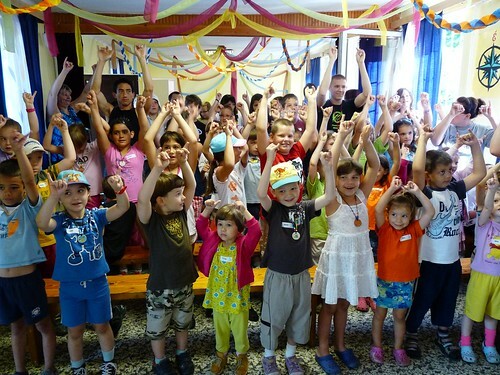 We expect that the work that God has begun in the hearts of these kids will grow and produce fruit. We look forward to seeing many of the teens attend our Friday Teen Outreach and many of the younger kids continue to attend Miki’s Bible classes in public school. We are also hopeful that some will even begin attending our church for the first time which happened after last year’s VBS as well. 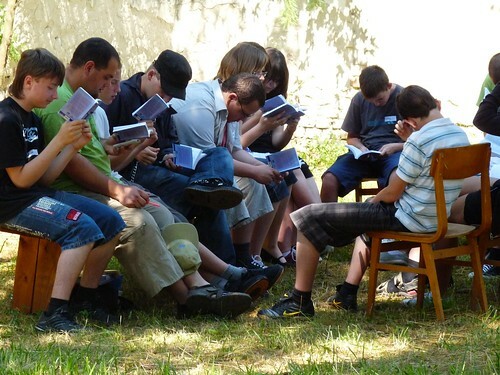 We have seen both teens and younger kids gain a greater understanding of the Gospel and some are either very close to a decision or have made decisions in their hearts. May God have mercy on all of them and graciously call them into His kingdom. May He use our local church as a powerful influence in their lives to turn their attention to the Lord Jesus Christ and to edify those who put their faith in Him. Above: Miki starting the day with an object lesson on faith. Marci (being blindfolded) would soon be lifted to an unknown height on a board and have to jump off the board. In reality the board was only lifted a few inches off the ground, but being blindfolded gives the feeling of a fearful height. Above: Afterwards Miki shared the story of Jesus calming the storm and of Jesus inviting Peter to walk on the water. 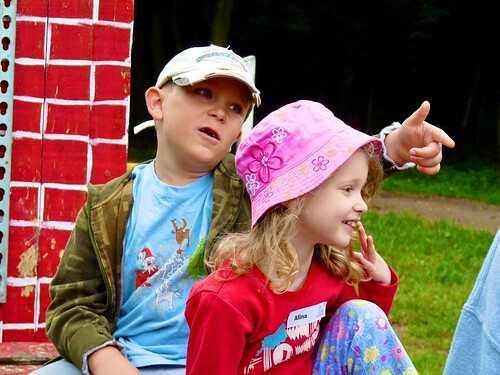 To help the story settle in, the kids were instructed to act out the entire story which they really got into! Above: Jenn leading some ice breaker games before teaching time in Miki’s small group. The group is getting along really well and friendships are being developed. 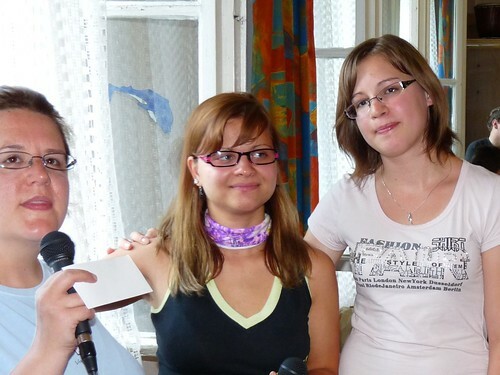 Miki asks for prayer for Viki (far left) who for years has shown a clear intention to be closed off and have a closed heart when there is teaching about a relationship with God through Jesus Christ. 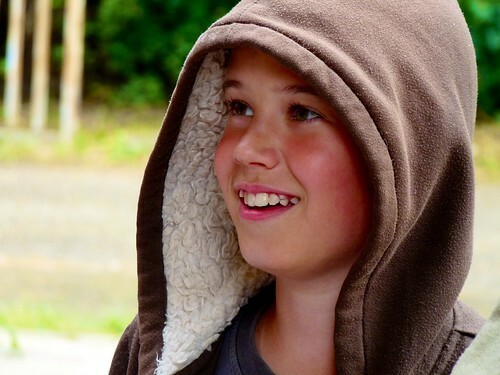 Above: Benedek who is also in Miki’s group constantly distracted other teens in our big meeting for teaching and singing the first three days of camp. After shuffling him to the front of the room with the preschoolers and giving him the responsibility to help the little kids pay attention and join in singing, his attitude and whole demeanor changed. Instead of having to deal with another day of constantly disciplining him, we praised God for how he was now participating and enjoying helping. Above: Benedek choosing to hang out with Laszló in free time for some one on one conversation. Above: Éva’s teaching her small group today’s lesson on Paul’s time in Ephesus. 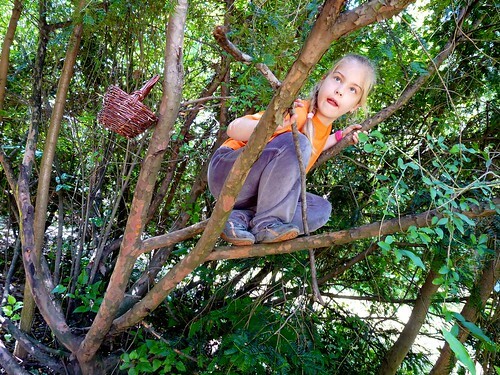 Above: Our teammate DezsÅ‘’s daughter Betti and Miki’s daughter Anna. 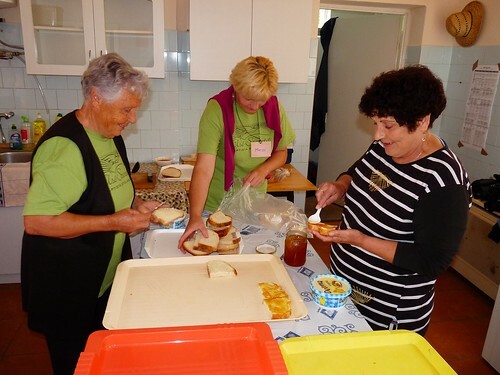 Above: Eszti, Tina (camp worker) and Zsófia. Eszti has attended our Friday teen outreach for the past year but is unable to come to church because of family responsibilities. After talking to her about faith in Jesus and the importance of fellowship with other Christians, Eszti decided to begin attending a Wednesday night women’s Bible study held at Brenda’s house. 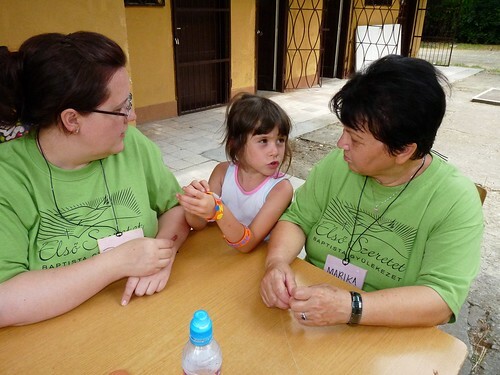 We hope to see Eszti continue to grow to be a mature woman of God. 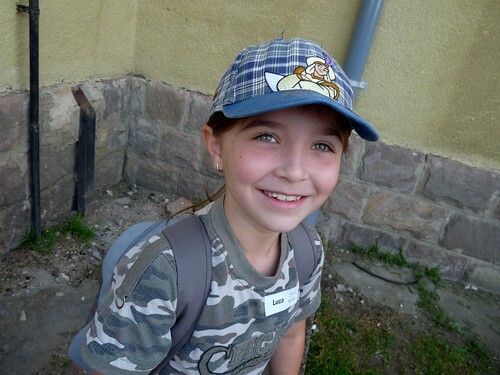 Eszti just a few years ago attended our VBS for the first time having little interest in God. What an encouragement to see God at work in her life. Eszti will also be attending our upcoming English camp. 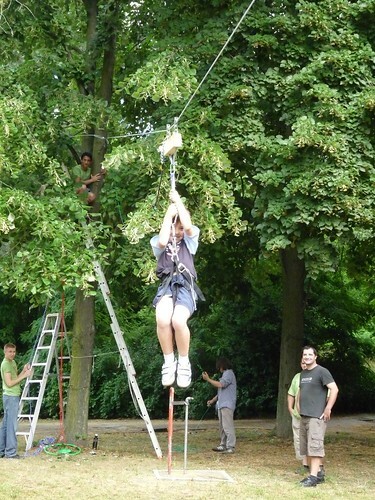 Above: Roger was hard at work today repairing the zip line he installed for VBS this year. 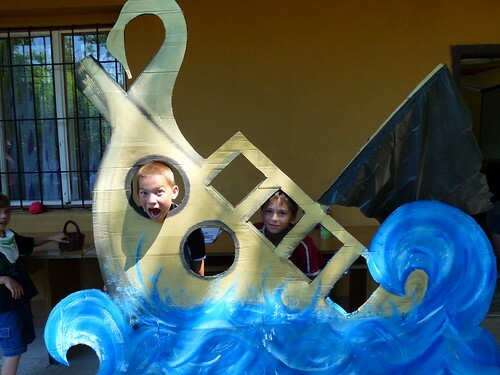 It was up and running again for kids at free time and is very popular with both young and older kids. 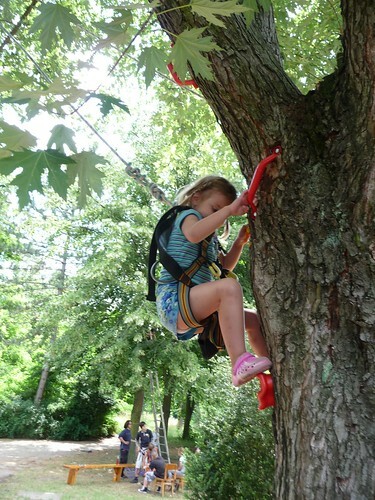 Above: Our little monkey girl Kira climbing to the top of a tree before swooping through the air with the attacked safety harness. 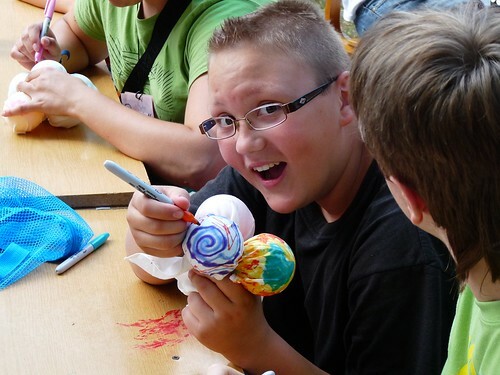 Above: Ádám enjoying today’s tie-die craft. 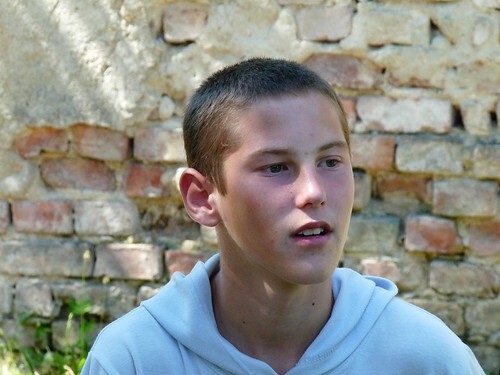 Ádám is also a teen who regularly attends our Friday teen ministry in PetÅ‘fibánya. 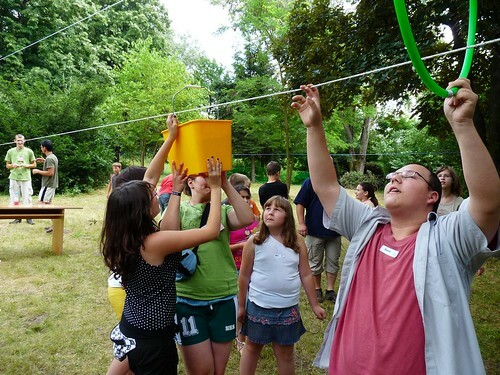 Above: Ádám’s big brother Dávid (far right) helping his team navigate a bucket full of water through an obstacle course. 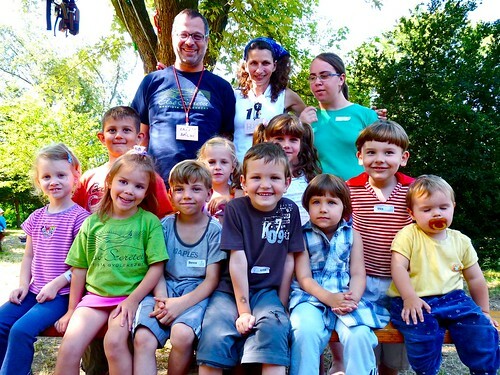 Dávid will aslo be attending our English Camp coming up next month. 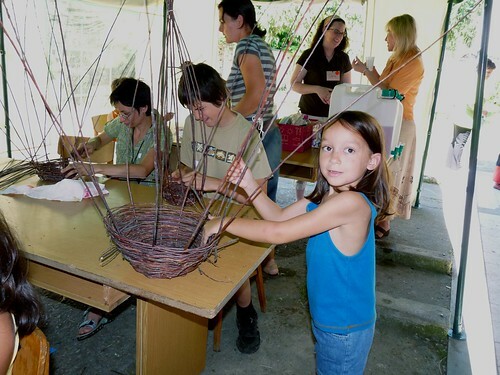 Above: Kids finishing their baskets as Klári continues to come everyday to lead basket weaving in our free time. Above: Miki and Erika performed a drama showing our sinful nature which leads to a shattered heart which can only be made new by turning our hearts over to God. Afterwards, Gabi (who recently turned 20 years, so I can’t call him a teen anymore), shared his testimony with the kids which included his turning away from God, and a season of living life with a hardened heart without God. Without God, Gabi began to hate the world and could find no joy in life. He shared about his repentance and God’s grace and love to not forsake him even through Gabi rebelled against Him. 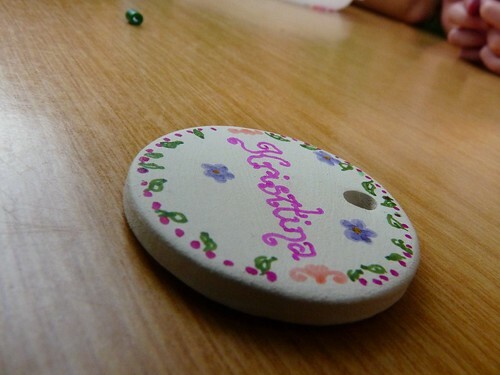 It was clear that this testimony hit very close to home for many of the older kids in our camp. 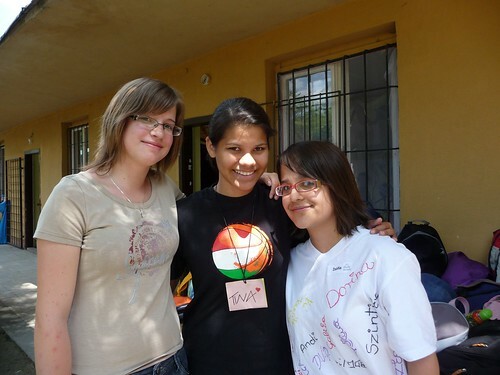 Above: Tomi (above left) who has shown signs of truly seeking over the past few days was overheard at the end of Gabi’s testimony saying, “It’s true, but I don’t know, I just don’t know what to do with all of this.” It is clear the the Holy Spirit is at work revealing Jesus Christ and convicting hearts. We pray it leads to decisions of faith in Him to be saved and set free in a new relationship of peace with God. • Even the older kids are joining in with singing and clearly know the lyrics which teach important truths about God. • Team continues to be healthy, no injuries and everyone is getting the rest they need at night. 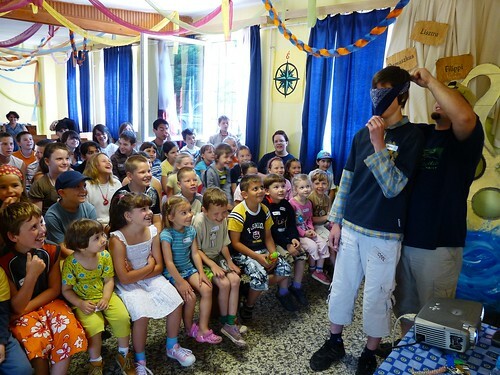 • Miki’s morning teaching truly engaged the kids and Miki and Erika’s drama was a great tie-in to Gabi’s testimony at the end of the day. • Gabi who was a little nervous gave a powerful testimony that God clearly used in various teens lives to draw them closer to Himself. • The team continues to be unified, hard workers serving one another and the kids with joy. 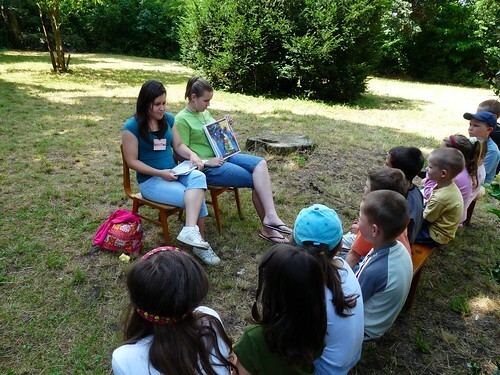 • Beautiful weather allowed the teaching and free time to be held outside. • Pray for Viki (mentioned above) who for years clearly shuts down and shows complete disinterest when the Gospel is presented. • Pray for Tomi who seems close to making a decision to turn to Jesus as His Lord and Savior. Pray for understanding and for the Spirit to continue to answer any remaining questions he may have. Pray for the leaders whom Tomi might turn to to be given wisdom as to how to speak and how to encourage and bless Tomi in this camp. 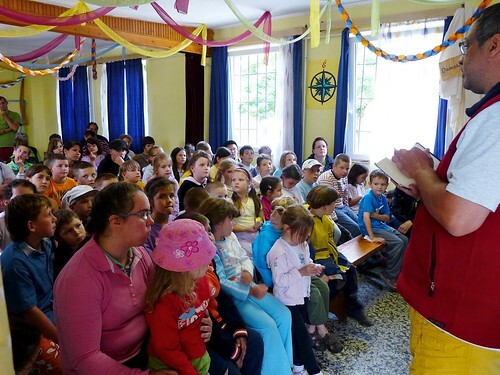 • Pray for Erika who will giving the morning teaching about God inviting everyone to be used by God as Paul was used as a minister of the Gospel. 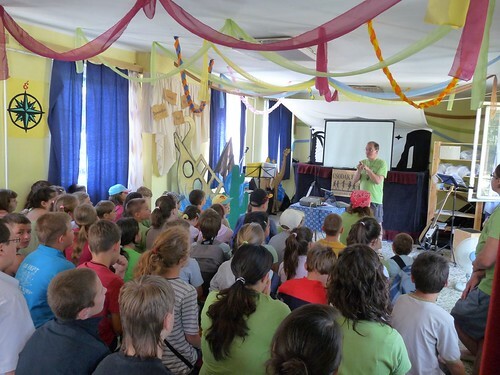 • Pray for our drama team who will be presenting the evangelistic end of the day skit and for DezsÅ‘ who will follow up with summary teaching. • Continue to pray for all of us (workers and campers) to sleep well and be refreshed for a new day together. Many camp workers are feeling completely worn out at the end of the day and we need God’s strength! 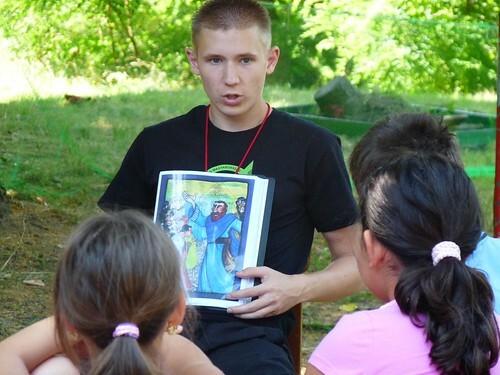 • Pray that the kids would be given understanding as they continue to memorize Scripture and learn lesson’s from Paul’s life from the book of Acts. 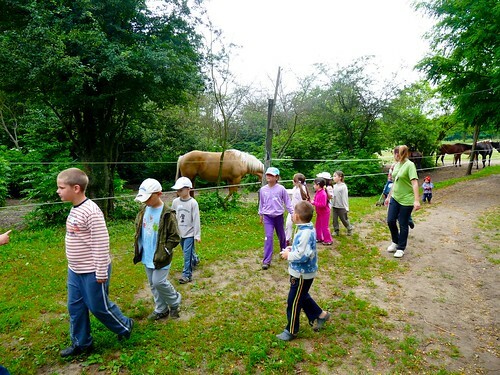 Above: Today, instead of walking directly to our camp site, we brought the kids to a local horse ranch just outside of PetÅ‘fibánya. 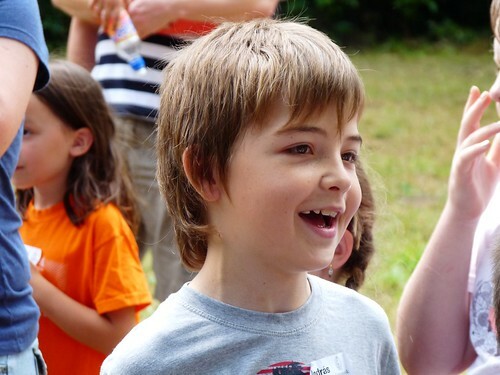 The owner’s son Csongor (pictured above left) is attending our VBS and having a great time. Just before leaving to return to our VBS camp site today, Csongor said to his mother, “How many days left until camp is over?” His mother, thinking that Csongor was implying that camp was getting boring said, “Just three more...” Csongor sadly replied, “Just three?” Just yesterday, Miki ran into Csongor’s mother in town and she shared that she would like to send Csongor to our church on Sundays. Csongor has never attended our church and we were excited to hear about his parent’s desire for him to attend. 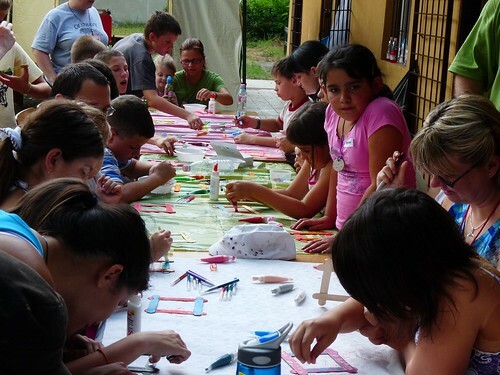 Already, about half the kids who attend our church come on their own initiative while their parents stay at home. We hope that this leads to entire families attending in the future. 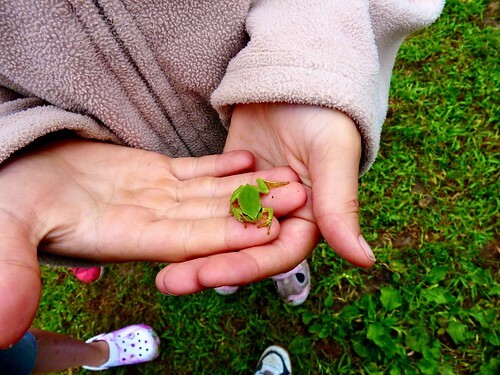 Above: Anna finds her favorite type of frog in the damp fields as the kids waited for the horses to show up. 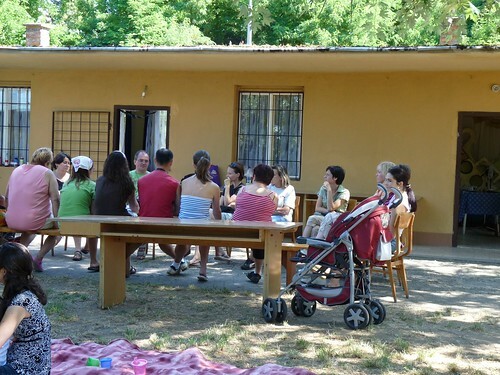 Above: Éva’s small group in which many of the kids have shared about their involvement in occult activities. Today one of the campers in her class asked why a person who was sincerely good could still go to hell. This gave Éva an opportunity to show them what God’s word teaches about all of us falling short and the problem of sin in our lives. 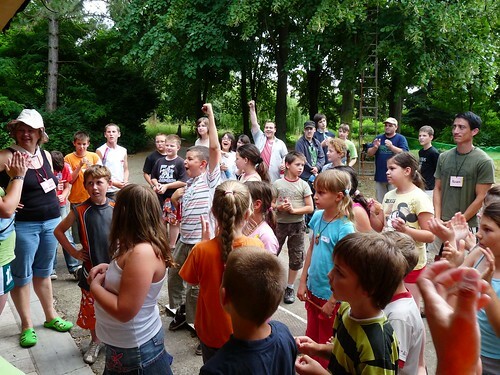 Later in the day, the teaching that happened in the larger group also reinforced what Éva said in her small group and then our end of the day evangelistic skit once again communicated it in clear terms. Although we had no idea this question would come up on this day, God knew and delivered his truth in multiple ways that these kids might understand. Above: Miki’s small group taking cover under a cluster of trees as the steady drizzle turned into rain. Even though the temperature dropped significantly and it was raining, the kids (as you can see) still had a great time and continued to bond together. I was thankful at the end of the day that instead of grumbling and complaining because of the somber weather, the kids had an enjoyable day. 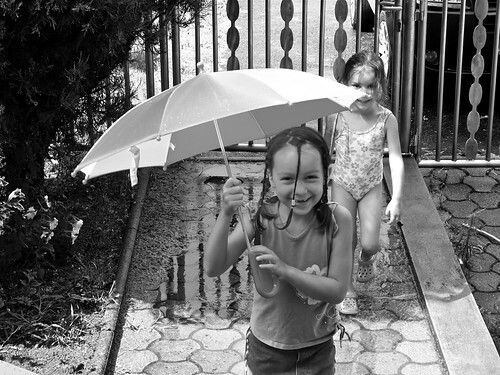 Even with the rain, it never fell to such a degree that the kids couldn’t ride horses. Everyone got to ride (even many teachers). 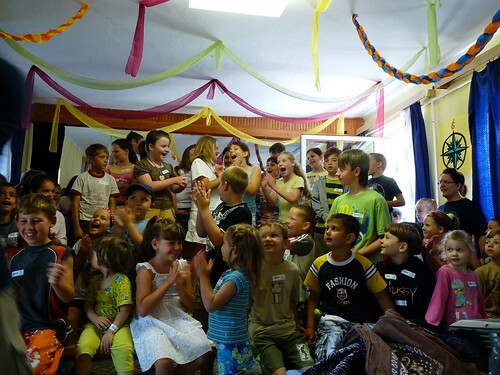 Above: After making our way back to our VBS camp site, it was time to sing! 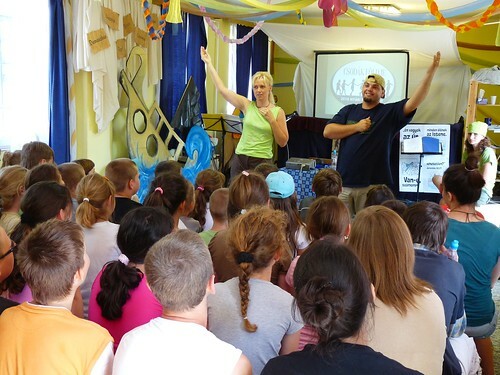 Niki, Erika and Hugi continue to do a great job teaching the children motions to each song. We are seeing each day more and more of the resistance of the back row of older kids breaking down and some beginning to more enthusiastically take part in singing. 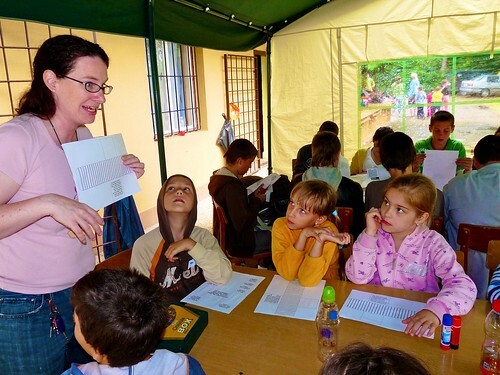 Above: Sharon explaining today’s craft that helped the kids to recall today’s teaching on Paul’s ability to rejoice and sing to God even in prison because of his belief in Jesus. 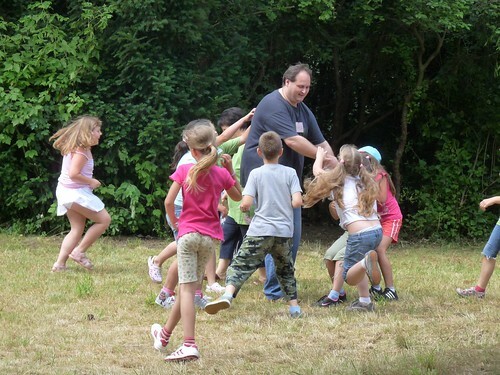 Above: As the end of the day drew near, God caused the rain to stop and the kids were able to enjoy game time outside instead of being cramped indoors. Above: Peti enjoying coffee in his invisible chair. Above: Laszló giving our end of the day teaching about how all have sinned and fallen short, and that only through trusting in Jesus and in His righteousness can any of us be saved. • Kids had a great time (even in the rain) horse back riding. No injuries even with all the slick muddy grass. • Teenager Tomi continues to be seeking. He had a good conversation with Roger while walking back home after camp. God is at work in his heart. 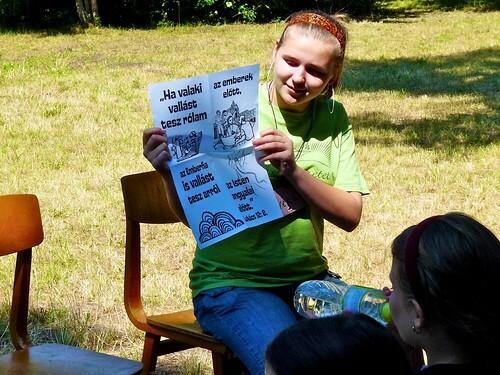 • Éva and Miki’s small group went beyond the planned curriculum and were able to answer questions posed by campers. • Team members are free of sickness and are getting the rest they need each night. • That God would continue to give us opportunity to answer questions/misconceptions about God especially in the older kid’s groups. 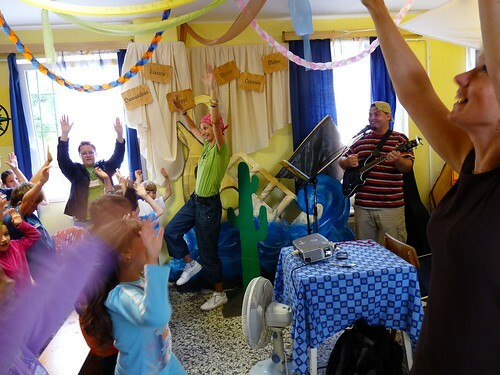 • That the songs we are singing would begin to settle in the kids hearts and encourage them even when they return home. 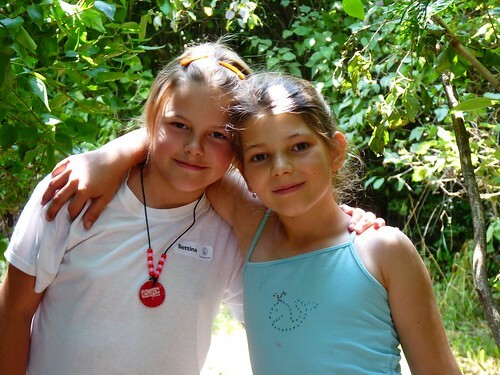 • For sisters Dorina and Laura who’s mother died just before camp started. • For continued protection from sickness and for a good night’s rest and strength for a new day. • For Miki who will be giving the morning teaching and Miki and Erika who will present the end of the day’s evangelistic drama. 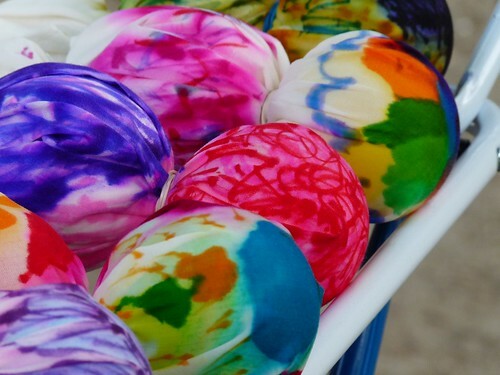 • For Gabi who will be giving his testimony to the kids tomorrow. 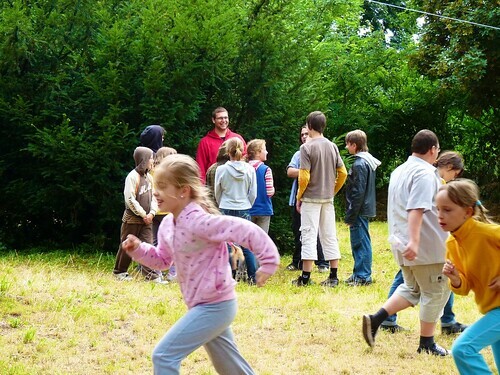 Above: Miki starting the day with a bit of exercise for the kids. Afterwards, Miki picked a few volunteers who were able to quote yesterday’s memory verse. Above: Éva taught about Elijah’s challenge to the 450 prophets of Baal and the end result of people recognizing who the one true God is. The kids were very engaged as Éva drew various parts of the story. Because of the conversations that came up yesterday with kids in our camp who have participated in occult activity, Éva and DezsÅ‘ brought this historic account into practical terms today. This gave them an opportunity to reveal God’s perspective of the evil in occult activities and His warnings to not participate in them. There was also more opportunity in Éva’s small group to talk about the subject,. 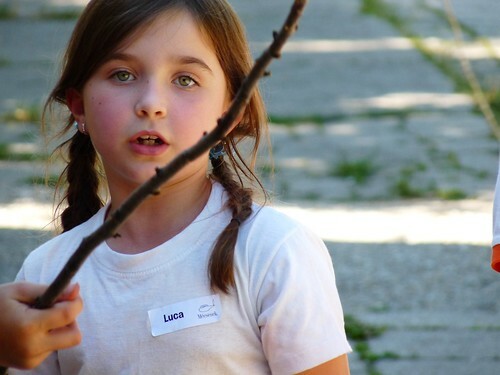 One camper began sharing about her belief in having many past lives and knowing details about them. This gave Éva an opportunity to share what the Bible teaches about life... that we live once and then comes judgment. She was able to share about Jesus’ teaching that He was the only way to heaven and that there was no other. Above: Tomi, who has attended our VBS in the past, shared how he wasn’t very interested in things about God before but now has gained a new interest. He has been paying attention in class and becoming more involved with good questions. Above: Robin was one of the kids in the morning who gave a very clear summary of what we learned yesterday in our small groups. His teacher shared that he has been asking questions about Jesus’ birth and the eternality of God. He is really seeking to know more about God and clearly understands about God’s forgiveness and our need to ask for forgiveness when we sin. 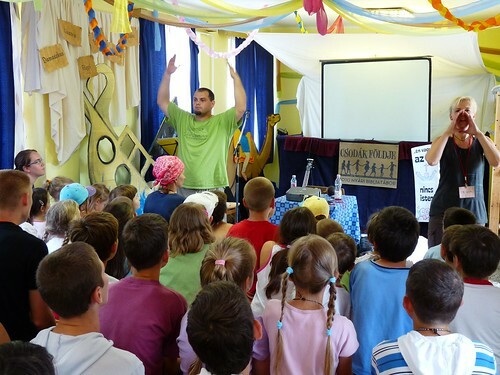 Above: Miki and Erika performing the end of the day evangelistic drama. They showed the various misconceptions and stereotypes about God and then presented Jesus as being the one true God. • Kriszti who had to travel to Budapest for a final exam passed her test and returned safely back to camp later in the day. 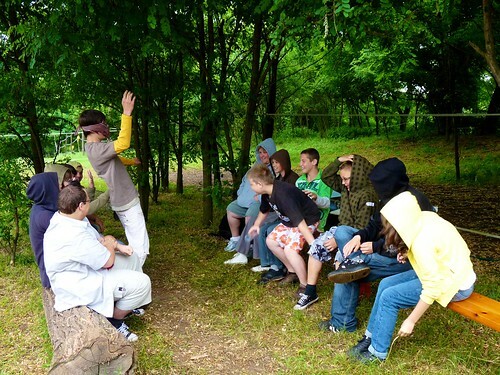 • With a few slight adjustments and face to face talks with a few kids, the teens had a much better day! 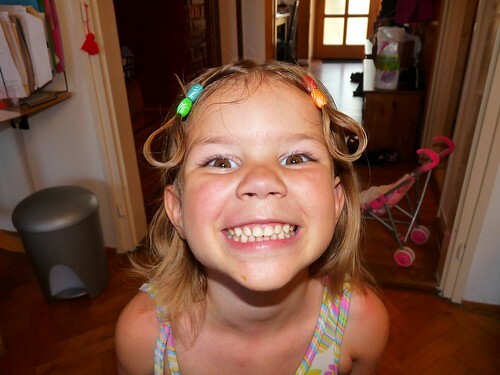 • DezsÅ‘ and Éva were able to bring teaching from God’s word that applied to the dangers of the kids who are involved in the occult. 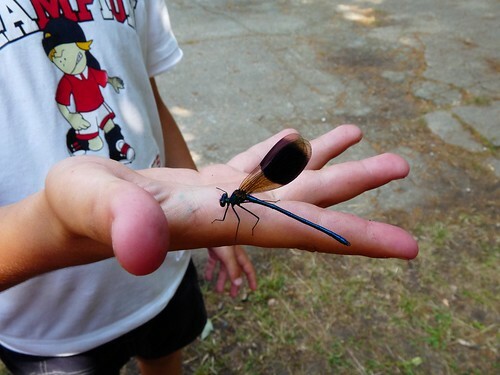 • Allen is doing better and discovered the source of his allergy attack (long grass/weeds irritating his legs on a walk back from taking kids to play soccer). • The team seemed refreshed and ready for a new day. We had a good night’s sleep. • Tomorrow we will be leaving our campgrounds for half a day of horseback riding. Please pray for good weather, ability to teach the kids while in the open fields at the ranch and for protection from injuries. • Please continue to pray for the teens (some of whom are clearly opening up and becoming more interested). 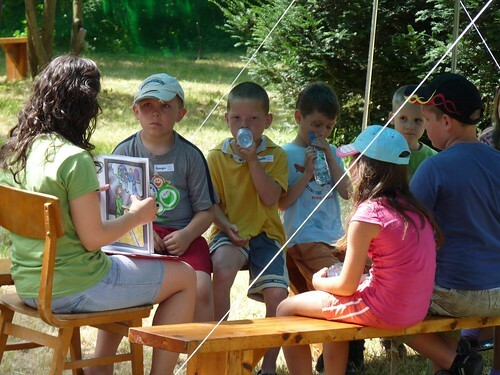 • Pray for small group times to be led by God’s Spirit and that God would use His word to draw reveal truth to these children and draw them to Himself. • Please pray for the team to get a good night’s rest, to be refreshed for a new day of ministry. Above: And here they come! 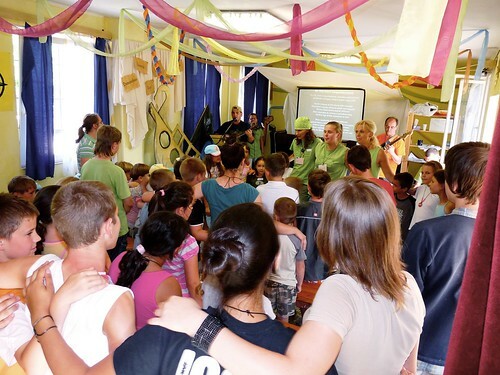 Soon after our morning time of prayer, parents began swarming to our registration tables for our first day of Vacation Bible School in PetÅ‘fibánya. 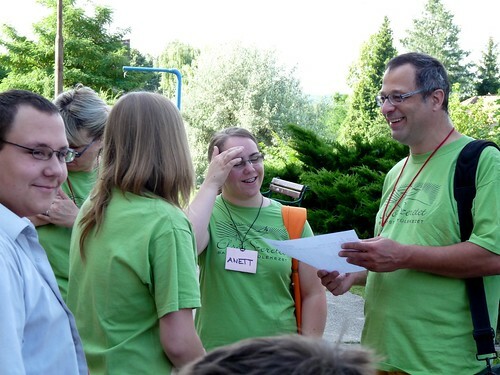 We praise God that the process of checking in, receiving name tags and walking over to our camp site went well! 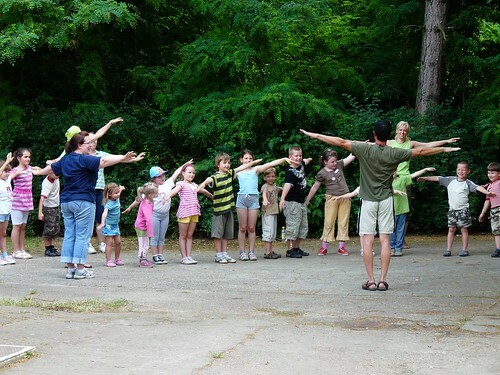 Because we have many preschoolers and first graders, there is always the possibility of nervousness and fear in those who don’t know what to expect in camp. 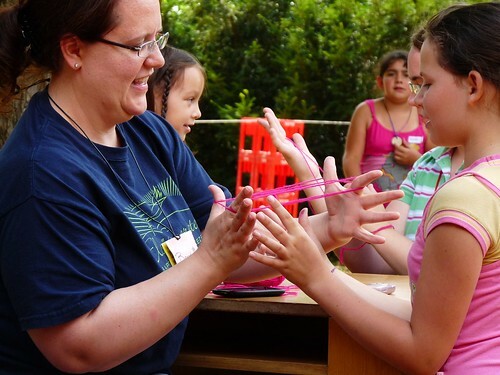 God was gracious to help the kids connect quickly with teachers and friends who are also attending camp. This was a huge answer to prayer. Above: The cute Mercer crew were super excited to begin camp today. Above L to R: Brenda, Laura and “Aunt” Marika. Laura started the day with tears near our registration tables. 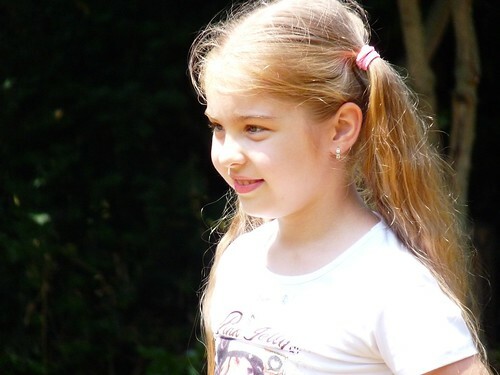 I later found out that both Laura and her sister Dorina just lost their mother who died a few days ago. Laura sat through the first set of songs in the morning crying, but clearly began to be encouraged and enjoy herself as the day proceeded. We thank God for helping her through this difficult time and are thankful that she can receive love and support at our camp. Above: DezsÅ‘’s daughter Adrien leading the pack with motions to our time of singing in the morning. 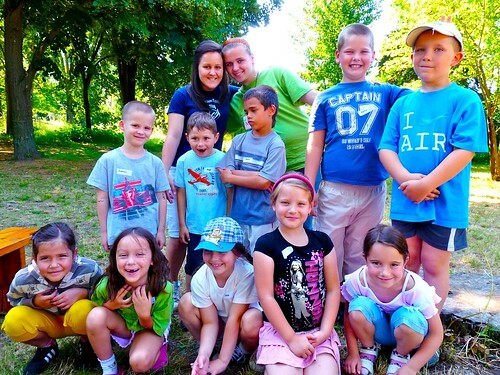 Above: Over fifty kids from preschool to teenagers are attending our camp this year. DezsÅ‘ began today’s teaching with details of the final days of Jesus Christ’s ministry on earth and how that ministry continued through the Apostle Paul who we will be studying in our small groups all week. Above: Miki leading the teen small group with helpers Peti and Tina. 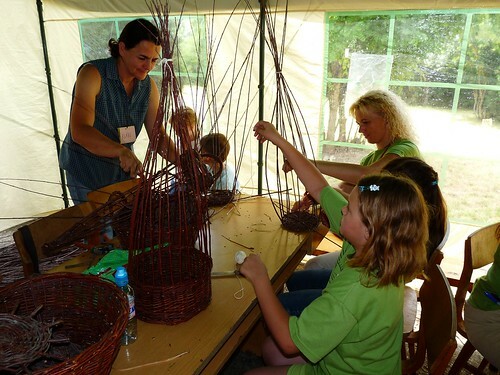 Above: Klári (above standing), who has attended our English Bible Study over the past year volunteered to come out to camp each day to teach kids basket weaving in our optional craft time. 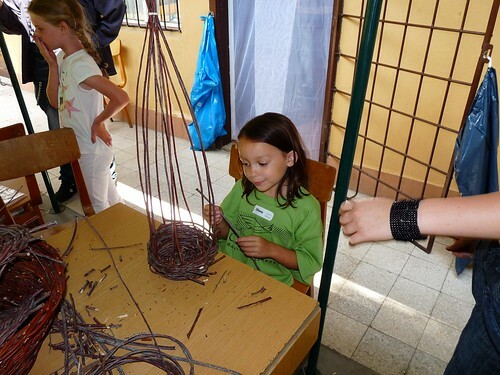 Above: Elianna excited about successfully weaving her first basket. 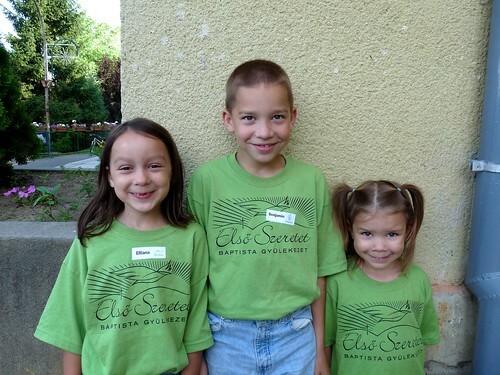 Above: Elianna and Tina who came out from Budapest to serve in our VBS. Above: Craft-master Sharon helping the kids assemble bracelets and necklaces. 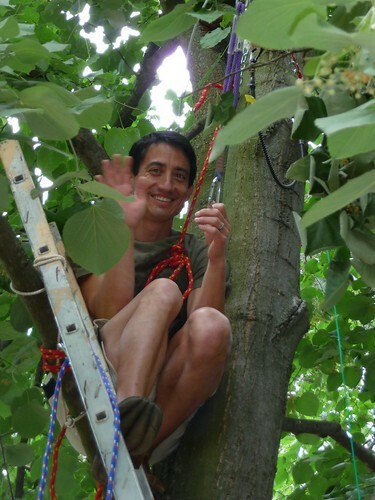 Above: Roger, high up in the trees giving a loving push to launch kids down the zip line that he came up with for this years game time. 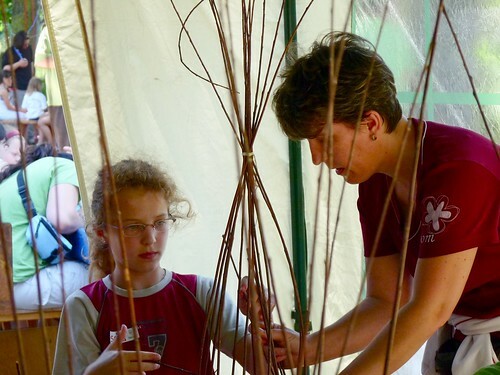 This is a very difficult project to pull off, and we are thankful for his help along with Peti and Gabi to build one of our most popular things at camp this year. 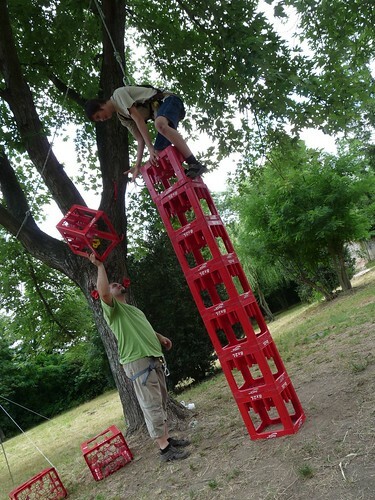 Above: Yeah, this is Peti. • The weather was great! 90% sunshine, a bout of rain that passed after 30 minutes. • The team (Primarily consisting of church members) is functioning well with unity and love toward one another. Each one did a great job at handling the responsibilities given to them today. 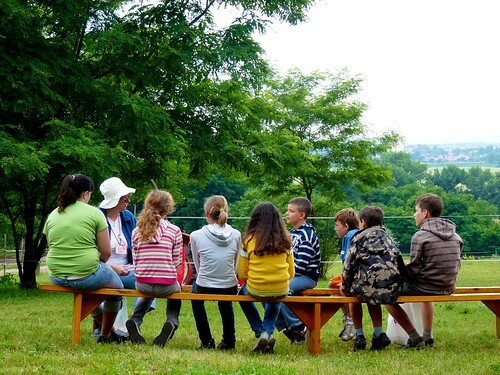 • One of the small groups of older kids is asking spiritual questions and truly seemed engaged in the small group teaching time. • God blessed us with strength for the day! • One of our team members will be traveling to Budapest tomorrow for a school exam. Please pray for Kriszti, for safety and that she would recall all that she has studied and for help with this difficult exam. 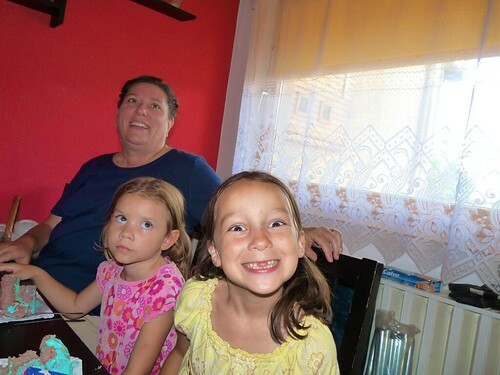 Please pray for DezsÅ‘ who will be teaching her small group tomorrow. 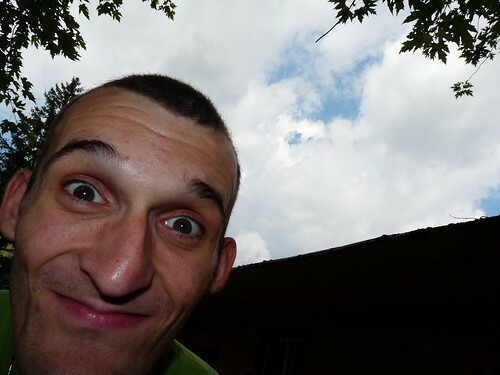 Kriszti will return later in the day. 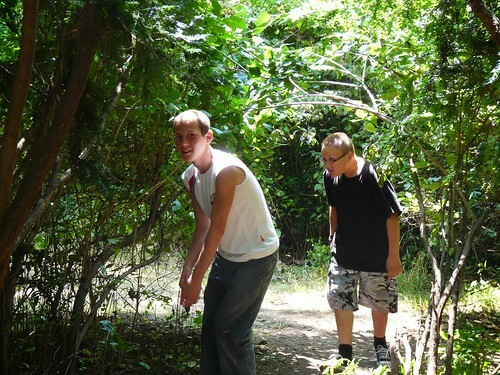 • A few teens are testing the boundaries we set in camp for the good of all who are attending. Please pray for these to be drawn into the teaching, to connect with teachers and to respond well to loving discipline if we have to take that step. • A group of older kids from one of the small groups revealed their involvement in occult activities. Please pray for these kids to be freed from the deceptions of the enemy, and to respond to DezsÅ‘ and Éva who will teach God’s perspective on these things (most likely tomorrow). 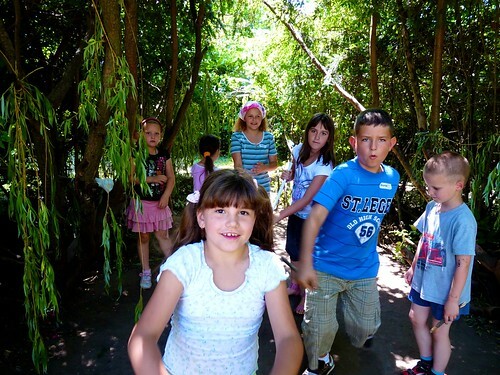 • Please continue to pray for children to come to a clear understanding of the Gospel message and for God’s Spirit to bring transformation to their hearts that they might believe. • Allen is suffering from an allergic reaction from something. Please pray for healing. • Pray for a great night’s sleep and refreshed bodies for a new day of serving in camp. We were all pretty exhausted (already) after the first day. 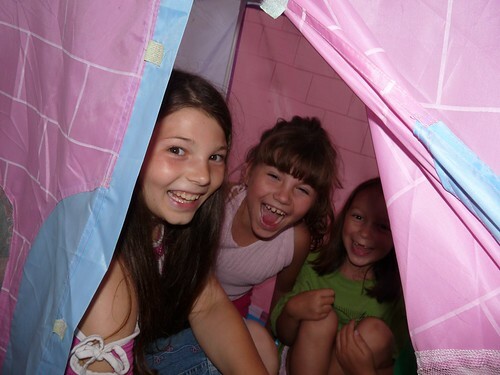 Above: As the parents are busy preparing crafts and teaching materials for VBS in the basement, the kids are having a great time out back in Elianna’s princess tent. 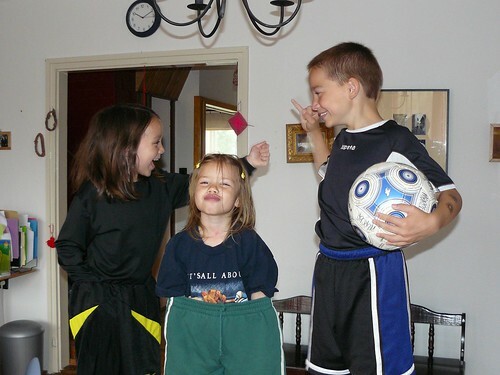 L to R: Anna (Miki’s daughter), Adrien (DezsÅ‘’s daughter) and Elianna. 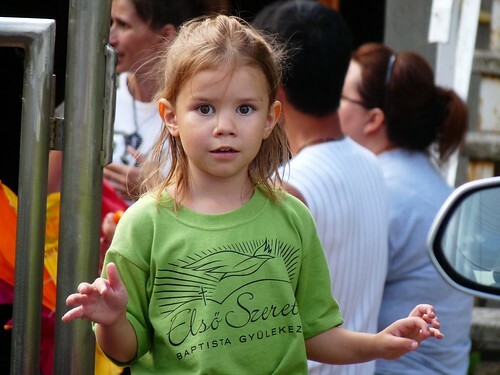 Above: Kira trying on this year’s camp shirt which has our church logo. 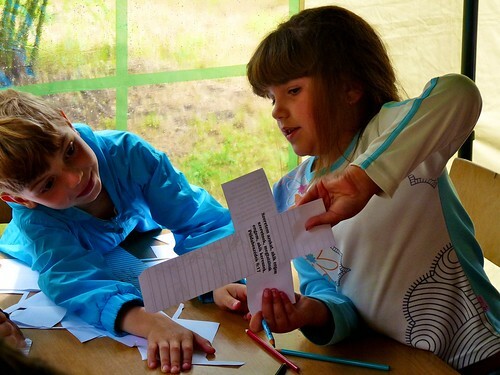 Above: Eszti, Erika and Marcsi preparing the names of various places the Apostle Paul traveled to on his missionary journeys. 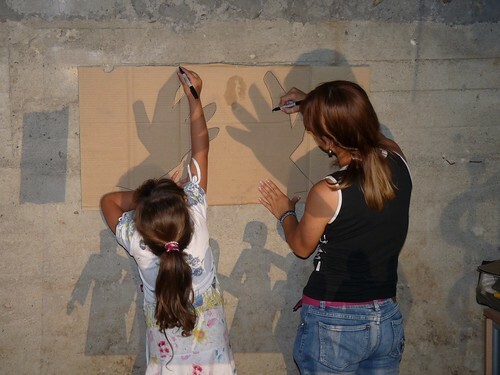 Above: Getting shadow puppets ready for Monday. 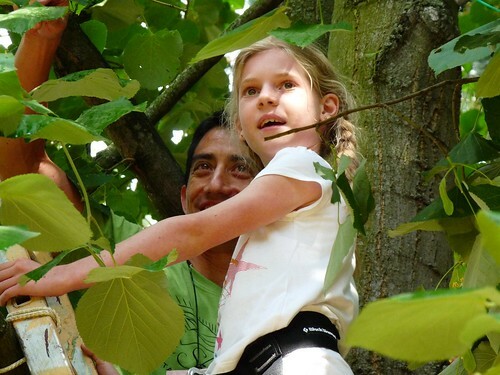 Above: Hugi and Niki helping collect and cut sticks for a handcraft later in the week. Above: Details, details, details... church members cutting and sorting material for memory verses and various games for over fifty kids who will show up tomorrow. Above: Peti setting up a mini book factory in our basement. 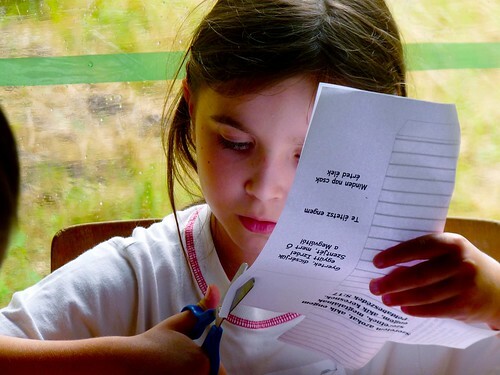 Each child will receive a fold out booklet with their memory verses they have learned throughout the week. Above: Sharon and Brenda smiling... I think this was before the refrigerator caught on fire. Yes, it really did. The building that the local government has given to us to use freely for vacation Bible camp is very old. After extinguishing the back of the refrigerator, Peti found that wires were not connected properly and this could have become a much bigger problem if it happened in the midst of camp. Thankfully, it happened while we were there prepping. Praise God! As of tonight, we have electric, but somewhere the wires are not connected properly as some have been shocked when touching pipes or metals around the building. It’s like living in that Operation game where you can’t touch the sides or your nose lights up bright red. Lord willing, we’ll have it all taken care of soon. 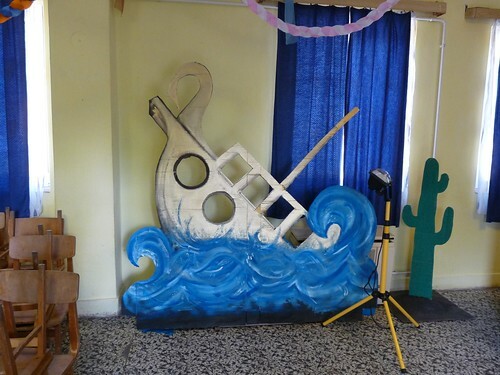 Above: One of our props that the kids can interact with that displays the shipwreck the apostle Paul experienced. • Please pray for the children to be free of fear on the first day. Many of them are very young and are very nervous the first day leaving home. Pray that they would enjoy their first day and find friends at camp. • Many church members are taking on more responsibility this year. Please pray that God would bless them with wisdom and equipping necessary to carry out their responsibilities. • The first day is usually full of twists and turns. Please pray for our team to be patient and loving toward one another, that God would maintain our unity and help us wisely navigate through the first day. • Please pray for over 50 kids who will be attending, many who have attended in the past. Please pray that they may come to clearly understand the Gospel and put their faith in Jesus Christ. 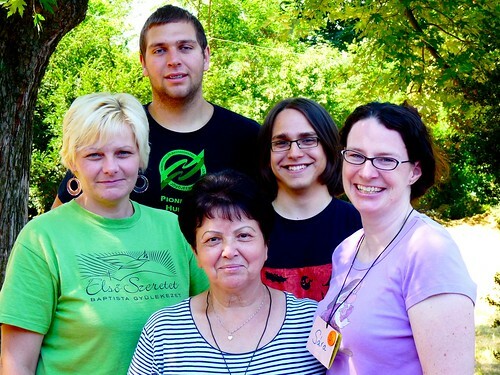 • Please pray for the teachers who will be leading small groups (Laci, Kriszti, Gabi, Erika, Éva and Miki). 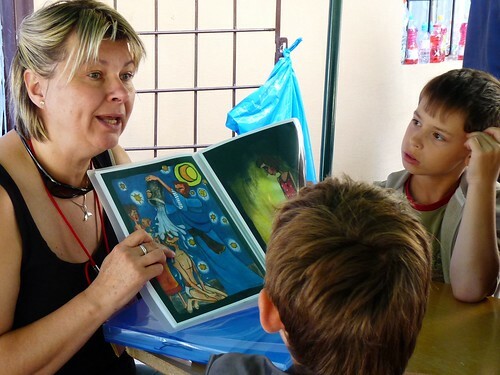 Please pray that they would be able to connect with their students and clearly present the truths found in tomorrow’s Bible lesson. 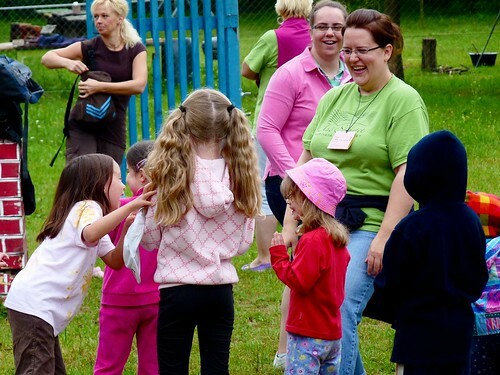 • Please pray for strength for our team who have been hard at work this week preparing and will need stamina to be a blessing to the kids this week. Above: Elianna showing off her two, or should I say lack of two front teach. 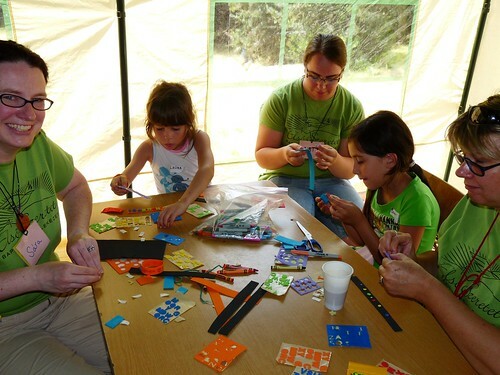 “Aunt” Cathy was kind enough to come out on Thursday to bring the remainder of materials needed for craft time for VBS. She was also able to celebrate Ben’s birthday with us. 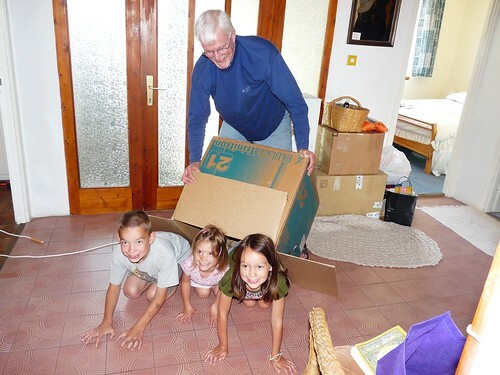 Above: Ben, Kira and Elianna spending some time with “grandpa” Jack and “grandma” Karen in Budapest before they returned to Africa.